A checked version of this page, approved on 14 April 2018, was based on this revision. Some may confuse geocentricism with the the idea that the Earth is flat. These are in fact two different ideas. 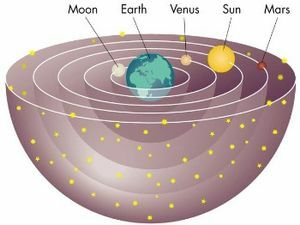 Geocentrism simply is the notion that the Earth is the (immovable) centre of our universe, thus all celestial bodies move around it. The ancient Greeks and the Europeans of the middle ages thought that the celestial bodies (the sun, the moon and the 5 known planets) all moved in celestial spheres around a spherical Earth. It should be noted that even though not all geocentrists are flat-Earthers, invariably all flat-earthers seem to be geocentrists. The Qur'an says that both the sun and the moon swim / float in a rounded course, or perhaps in a celestial sphere or hemisphere (a 'falak' in the Arabic). It seems that Allah brings the sun from the east, it goes high above the Earth and ends after sunset with the Sun going to a resting place. All this took place around an Earth that was spread out and had a firmament of seven heavens built without pillars that can be seen above it. This was a common belief in the region at that time and can be found earlier with the Babylonians, ancient Hebrews, the Assyrians and other cultures in the region. The following is a list of what makes the Qur'an geocentric. A detailed discussion of these and further evidence follows in the rest of the article. The courses taken by both the sun and moon are visible to the people addressed in the Qur'an. The Qur'an says that the moon follows the sun. The floating/swimming (the verb جري) of the sun is always mentioned with that of the moon, and in these verses they are nearly always mentioned in the context of night and day. Qur'an 36:37-40 is a passage about night and day. Right after describing the change from day to night it says that the sun runs on to a resting place for it (see footnotes regarding the Arabic word here, which differs from similar verses). There are also sahih hadith that use the same Arabic word as in verse 36:38 to mean a resting place as part of the sun's daily cycle.. The alternative view was that it refers to the sun's final resting on the last day. Another similar sahih hadith probably supports this view. Whichever interpretation was intended, the sun's movement is nevertheless mentioned right after describing day and night, just as the next verse mentions the different mansions appointed for the moon each night. The whole passage is about day and night and the sun and moon's movement in that context. The sun and moon each float in an orbit (verses 21:33 and 36:40), or more precisely, each in a "falak", a word with various meanings related to rounded or circular, and also hemisphere shaped things, as described in Lane's lexicon of classical arabic. His main definition is the place of the revolving of the stars, the celestial sphere, generally imagined to be a hemisphere by the Arabs, or the pole of the heavens. The more common English translations, 'orbit', or 'rounded course', seem to be based on the meanings related to roundness or circling (around a hill) and on comments by ibn 'Abbas recorded in the tafasir (commentaries) of al-Tabari and of ibn Kathir, where he explains the sun and moon swimming in a falak to mean 'in a whirl (whorl), like the whirl of a spindle'. It may also be based on another ibn 'Abbas comment, as noted by ibn Kathir, that the sun runs in its falak in the sky / heaven during the day, and when it sets, it runs at night in its falak underneath the Earth until it rises in the east.Al-Tabari further mentions other opinions, such as that it means the pole of the heavens, and similarly, the shape of an iron [axis of a?] millstone. It is not for the sun to overtake the moon, though on the last day they will be joined together, which is rather suggestive of them orbiting the same body at a similar distance from us. The stars have settings (mawaqi) , but only the day, night, the sun and moon are mentioned as all floating in an orbit (falak), while there is no indication of the Earth's own orbit. Abraham is approvingly quoted as saying that Allah brings the sun from the east in one verse, and setting and rising places of the sun are reached and described in the Dhu'l Qarnayn story. For the Qur'an to be scientifically credible, it must contain accurate statements in regards to all that is visible i.e. material objects and phenomena. How can Allah appeal to such things as signs of his power and existence if he fails to make his case obvious? A common claim is that references in the Qur'an to the sun's movement concern its 225 million year orbit around our milky way galaxy rather than to a geocentric orbit. Yet the author of the Qur'an describes a movement of the sun (as well as of the moon) that he expects any of its listeners to see, hence it does not mean a galactic orbit. The words 'and that' (wa anna) towards the end of the verse indicates that "Do you not see" applies to the entire verse, and leaves no doubt that not just the day and night, but also the running of the sun and moon were things that the 7th century listeners of the Qur'an were expected to know; they could 'see' the night turn into day and vice versa, they could see the sun and the moon running their courses around the earth. The people could see Allah's signs, and Allah could see them. The following verse says that the sun and moon running their courses are signs (ayaat) to mankind and thus they must be visible (or known) to a 7th century Arab audience. It says they are explained in detail in the Qur'an to strengthen the faith of Muslims. Yet the modern galactic orbit explanation requires outside knowledge and recent science, and these verses cause doubts in the minds of Muslims. […] He has subjected the sun and the moon! Each one runs for a term appointed. He regulates the matter, explaining the signs in detail, so you can be certain of meeting with your Lord. In the following verses the Qur'an clearly tells us that the sun follows a daily cycle, which ends every night when the sun goes to its resting place (ِمُسْتَقَرٍّ See the footnotes for the Primary Evidence section regarding this word). As usual in the Qur'an (13:2 being the only exception), the sun's movement is mentioned in the context of night and day. A token unto them is night. We strip it of the day, and lo! they are in darkness and the sun runneth on unto a resting-place for him. That is the measuring of the Mighty, the Wise. And for the moon We have appointed mansions till she return like an old shrivelled palm-leaf. It is not for the sun to overtake the moon, nor doth the night outstrip the day. They float each in an orbit. Waalshshamsu (and the sun) tajree (runs) limustaqarrin (a resting point) laha (of it). Notice how the sun's movement is almost always mentioned in the context of night and day. The 225 million year galactic orbit interpretation would have no relevance to human timescales, nor would it be "a token" or sign for 7th century listeners, nor would it make sense in the context about the night-day cycle. In the following verse the Qur'an tells of an indirect observation of the sun's movement. Aside from other light sources, shadows on Earth require the sun to exist, but it seems that for them to lengthen rather than being stationary requires the sun to guide them according to this verse. Yet if the Earth did not rotate (so shadows were stationary) and then the Earth was made to rotate (so that they could lengthen and draw in) the sun would not need to be made to do anything different in either case. Thus the most likely explanation is that the verse represents a geocentric worldview where the sun moves across the sky, guiding the shadows. The Qur'an has some statements about the end of the world that are much as one would expect if the author believed the sun and moon to be of similar size and a similar distance from Earth. The word translated "are joined" is Arabic jumi'a, a verb which means to collect together, gather together, bring together. Now given that this would actually require the moon to travel 98 million miles away from Earth and into the sun, which is over 600 times wider, it is far less suitable as an apocalyptic event than if the ancient understanding of the cosmos was correct, and it is not credible that an author with accurate knowledge of the solar system would describe such an event using the words found in these verses. The courses of the sun and the moon are also a pair of sorts, according to the Qur'an. This indicates that the sun takes a path or action similar to that of the moon (which does indeed go around the earth once per month, and to an ancient person seems to do so on a nightly basis). The word translated "follow" is used many other places to mean recite, but is primarily defined as to follow, go or walk behind, follow in way of imitation, of action etc., and is often used for animals like camels following behind each other. Yet the Moon does not follow behind the sun's movement, nor does it provide its own light like the sun. It might merely seem to a naive observer to do these things. Notice also in the above verse that the sun's movement (as well as day and night) are a token, or sign, that the hearers can readily observe. Various verses explain the shape of the sun's course. Apparently Allah brings the sun from east, it travels high and eventually goes down. Most of these can be dismissed as the same kind of convenient language we would use today (Quran 20:059, Quran 20:130, Quran 17:078, Quran 6:77-78, Quran 18:17). Some are more interesting, however. The Qur'an approvingly quotes a few lines from a debate between Abraham and a disbelieving King, where Abraham replies that Allah brings the sun (yatee biashshamsi يَأْتِى بِٱلشَّمْسِ) from the east. The arabic verb and preposition indicates that the sun actually moves. The Qur'an is quite clear about the course of the sun. It does not even describe a complete orbit, but merely a rounded course, probably in a hemisphere (falak) that has a beginning, an end, and a highest point. The picture is pretty clear: the apparent daily course of the sun dictates the time of each and every daily prayer and the only examples of the sun being used for timekeeping in the Qur'an employs the sun's daily movement along the sky. Despite all the verses discussed above that strongly indicate a geocentric worldview, Islamic websites present a few counter arguments to try to prove heliocentricism in the Qur'an. We saw above that the galactic orbit interpretation for the sun's falak does not stand up to scrutiny. In the same section above we also saw that 36:40 ('it is not for the sun to overtake the moon...') is evidence of geocentrism rather than heliocentrism. Two other verses are sometimes used to try to demonstrate knowledge that the Earth rotates on its axis. At first it seems plausible to suppose that 'day' and 'night' refers to the process of the Earth's rotation revealing and obstructing the view of the sun (though the verse also fits with a geocentric view where 'day' and 'night' are processes when the sun is above or below the horizon). But this idea quickly falls apart when comparing with other verses as detailed below, but also even examining the verse in isolation. For the Earth is actually a globe, and there are no specific times 'when' (itha) the day reveals the sun or the night conceals it. Rather at all times half the Earth is in daytime and half in nighttime, so the sun is at all times both revealed and concealed. This problem wouldn't arise if the word 'when' (itha) was absent in these verses. There are other verses that mention the night covering (with the same Arabic verb as 91.4), which show that the verb in this context does not simply mean the body of the earth blocking the line of sight to something. Verses 92:1-2 use identical words as 91:3-4, but without the pronoun suffix at the end. So the night is when things generally are covered, not just the sun on the other side of the Earth, and the day is when things generally are revealed. Clearly the verbs are meant in a poetic sense. Indeed, in the verse below the night's cover (same verb as 91:4) can apply to anything, not just the sun, so how can night covering the sun in 91.4 literally mean the body of the earth covering the sun on the other side? (The word "pieces" in the translation means portion or piece cut off from the whole). With the same arabic word for cover yet again in verse 7:54, this time it is the day doing the covering, or possibly the other way round (the Arabic is ambiguous and translations differ, while tafsirs take the view that it means both) and it is quite a stretch if not impossible to interpret this as the rotating Earth blocking the night (whatever nonsense that could mean) in analogy to their interpretation of 91:4. Rather it seems that the day and night are active entities in the Qur'an. The other verse used as evidence of heliocentrism is 39:5. Here the word translated wraps (kawwara, as with a turban, for example) supposedly indicates the rotation of the Earth. He created the heavens and earth in truth. He wraps the night over the day and wraps the day over the night and has subjected the sun and the moon, each running [its course] for a specified term. But as with 7:54 mentioned above and the verses where the day and night (as well as the sun and moon) have a falak, it actually indicates that the night and day are active entities rather than any sign that the Earth revolves. You could reasonably describe the Earth as passing through night and day. Perhaps, at a stretch, you could even say that night and day wrap around the earth as you could spin an item in order to wrap it with something. But it would be utter nonsense to describe what really happens by saying that the the day or night wrap each other, for they are always on the sunward and opposite sides of the Earth. To even try to make it work you would have to suppose that 'day' means the half of the Earth that is currently sunward, and 'night' means the shadow of the Earth cast by the sun, but then to make the next phrase work you have to suppose that 'night' means the half of the Earth that is currently opposite the sun, and that 'day' means the light from the sun. So at the halfway point in the sentence you have to change your definition of the word 'day' and the definition of 'night' to make it fit the real situation! A common claim by some of those who believe that 39:5 is a reference to the Earth's rotation is that this phrase is the most perfect that Allah could use without causing 7th century Arabs to dismiss Muhammad as a lunatic. Yet the Qur'an itself records that Muhammad was much mocked anyway by those who disbelieved what he said, and the Qur'an contains many claims that sounded absurd even to many of his contemporaries, so it is reasonable to ask why the Qur'an could not give even some vague indication that the earth itself is revolving or that it has an orbit. There are also two nearly identical verses to 39.5. These are 31:29 and 35:13 (also with the similar phrase are 3:27 22:61 and 57:6) where instead of 'he wraps', the verb 'he causes to enter' (yooliju) is used. Together, along with 7:54 where the day covers and chases the night (or vice versa), they present a picture of the day and night successively wrapping across each other and in so doing covering the other and entering into it, though the night never outruns (sabiqu) the day (36:40). In the Hadiths we read Muhammad's own words, and they clearly paint the same picture: the sun moves around the earth and goes to "its resting place" at night, and will one day be told to go to "the place of your setting". Even though these Hadiths are all deemed 'sahih' (authentic) according to Islamic scholars, some apologists will deny them without any valid reason other than for their anti-scientific nature. Of course the Hadiths, at the very least, indicate what Muslims around the time of Muhammad (or not long after his demise) believed about the sun and how to interpret the Qur'an correctly. is seen by 7th century listeners without knowledge of galactic orbits. is almost always mentioned with that of the moon in the context of night and day. has setting and rising places. Allah brings it from the east, it goes up high, then goes down, and it has a resting place. In addition to all these facts; great ancient, and even modern-day, Muslim astronomers agree that the Qur'an is geocentric, and the Hadiths also affirm this geocentric cosmology (so Muhammad or at least the people around him agree with it). What else can one conclude, other than that the Qur'an is geocentric? Whoever wrote the Qur'an thought that the sun orbits our planet. It is now known this is not true: the sun is not orbiting our planet and it is certainly not in a daily rounded path that looks like half a circle. In ancient times, many people - but certainly not all - did not know any better than what they seemed to observe everyday: the sun appeared to be going around the Earth through our skies. This belief could be expected from a 7th century Bedouin, but not from an omnipresent, omnipotent, omniscient creator, who should be able to produce a perfect book that doesn't require acrobatic apologetics to defend. ↑ 1.0 1.1 1.2 1.3 Falak Lane's Lexicon Volume 1 page 2443 and page 2444 Lane also says that the Arab astronomers said there were seven of these spheres for the sun, moon, and the five visible planets, rotating about the celestial pole. This must reflect the post-Qur'anic influence of Ptolemy, whose astronomical work was translated for the Arabs from the 8th century onwards. ↑ A few translations use instead, "appointed term", though in nearly all other verses where we find mustaqarrin (qaf-ra-ra قرر Lane's Lexicon Volume 1 page 2501) as a participle they translate it as a place of settlement or an abode or resting place. There are other verses (35:13, 31:29, 39:5, 13:2) that mention the sun and moon floating/swimming (with the same verb as is translated "run" in 36:38) for a term appointed, but these use the words لِأَجَلٍ مُّسَمًّى which do indeed mean a term appointed, but note that mustaqarrin مُسْتَقَرٍّ in 36:38 is a different word. ↑ The Arabic reads:فِي فَلْكَة كَفَلْكَةِ الْمِغْزَل fee falka, ka-falkati almighzal - at-Tabari and ibn Kathir on 36:40 quran.al-islam.com (select the tafsir, surah and ayah). Similarly for 21:33 in ibn Kathir, "Ibn Abbas said, 'Spinning like as spins the spindle in a whirl'". Lane translates the exact same words attributed to ibn 'Abbas as "the whirl of a spindle...thus called because of its roundness...it is a piece of wood, generally of hemispherical form, or nearly so, through the middle of which the upper part of the spindle-pin is inserted" (see link to his lexicon page 2444 in an earlier footnote for falak above). Ibn Abi Hatim recorded that Ibn `Abbas said, "The sun is like flowing water, running in its course [falakha] in the sky [alssama] during the day. When it sets, it travels [at night - bi al-layli (omitted in the translation)] in its course [falakha] beneath the earth until it rises in the east. He said, "The same is true in the case of the moon. Its chain of narration is Sahih. ↑ alif-taa-ya Lane's Lexicon Book 1 page 15 The verb means to come, and when it has an object with the bi preposition it means to bring, as in many other instances in the Qur'an.